HomeCOMMENTARYYemen: Court Battle Exposes UK–Saudi Arms Trade, A Marriage Made in Hell. Yemen: Court Battle Exposes UK–Saudi Arms Trade, A Marriage Made in Hell. Yemen – Court Battle Exposes UK – Saudi Arms Trade. A Marriage Made in Hell. On Monday 10th July, a ruling was handed down by London’s High Court, which should, in a sane world, exclude the UK government ever again judging other nations’ leaders human rights records or passing judgement on their possession or use of weapons. The Campaign Against the Arms Trade (CAAT) lost their case to halt the UK selling arms to Saudi Arabia, the case based on the claim that they may have been used to kill civilians in Yemen. Anyone following the cataclysmic devastation of Yemen would think it was a million to one that the £3.3Billion worth of arms sold by the UK to Saudi in just two years had not been used to kill civilians, bomb hospitals, schools, markets, mosques, decimate vital and economic infrastructure and all necessary to sustain life. “Where it could not be established whether a location attacked was civilian or military, the strikes were classified as unknown, of which there are 1,882 incidents.” All those “unknown” killed had a name, plans, dreams, but as in all Western backed, funded or armed ruinations “it is not productive” to count the dead, as an American General memorably stated of fellow human beings. So the oversight of what constitutes a “clear risk” of mass murder and humanitarian tragedy goes to the Minister whose Ministry stands to make £ Billions from the arms sales. Another from that bulging “You could not make this up” file. For anyone asleep at the wheel, Foreign Secretary, Boris Johnson, is supposed to be the UK’s chief diplomat. Definition: “a person who can deal with others in a sensitive and tactful way. Synonyms: Tactful person, conciliator, reconciler, peacemaker.” Comment redundant. So Saudi investigates itself and the Secretary of State over views his own actions in the State profiting in £ Billions from seemingly indiscriminate mass murder and destruction. Pinch yourselves, Dear Readers. It would seem we live in times of the oversight in the land of the seriously deranged. “This is a very disappointing verdict and we are pursuing an appeal. If this verdict is upheld then it will be seen as a green light for government to continue arming and supporting brutal dictatorships and human rights abusers like Saudi Arabia that have shown a blatant disregard for international humanitarian law. “Every day we are hearing new and horrifying stories about the humanitarian crisis that has been inflicted on the people of Yemen. 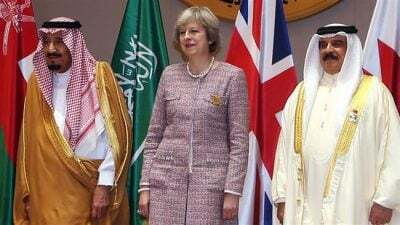 Thousands have been killed while vital and lifesaving infrastructure has been destroyed.” The case had exposed the UK’s “toxic relationship” with Saudi Arabia. On Wednesday 12th July, UK Home Secretary, Amber Rudd again invoked “national security” (something Yemenis can only dream of in any context) and presented Parliament with a paltry four hundred and thirty word “summary” of the Report on the funding of terrorism, origins of which go back to December 2015. Peanuts compared to UK arms to Saudi Arabia. CAAT’s appeal is to go back to the High Court and: “If it fails, will go to the Court of Appeal” states Andrew Smith. Final confirmation that the British government’s relations with Saudi over Arms and Yemen lies somewhere between duplicity and fantasy would seem to be confirmed in an interview (5) with Crispin Blunt, MP., former army officer and Chairman of the Foreign Affairs Select Committee. In that case, the cynic might conclude, given the devastation caused by the British army in Afghanistan and Iraq, perhaps it is not only arms and money that are the ties that bind the two countries but scant regard for humanity itself.